That’s right we’re talking all things Leeds! The glittering heartland of the North of England, Leeds is the UK’s third largest city, described as both “among the driest cities in the United Kingdom” and “a hub of public-sector health bodies.” We’re going to let you in on a secret they don’t often tell you about though…Leeds is actually really great, they’ve been trying to keep it from you, the stereotype of Yorkshire folk being “a Scotsman with all the generosity squeezed out” is not for nowt you know, they’re keeping this stunning, vibrant city tucked away up there, and some of you are missing out! The home of cinema, Louie Le Prince filmed the first moving picture sequences there in 1888, Jelly Tots and a lot of actually really good tall buildings, the 2010 award winning, rusted tower block Broadcasting Place is about as good as modern architecture gets in our humble opinion. Leeds is a modern, thriving city, and it is perhaps no surprise that with that has come an awful lot of good music. The thriving scene emanating from the working men’s club turned musical Mecca, The Brudenell Social Club may on first glance seem an unlikely thing. You could certainly be forgiven for not even noticing it’s there, walk past The Royal Park Pub, past Abu Bakar’s supermarket, turn right, head over the car park and it’s that small white building in the distance. Wander in when there’s not a gig on and you’ll probably find a couple of bar staff and a handful of regulars propping up the bar. Go when they’ve got one of the many high-profile international acts in their gig room and it’ll be heaving, wall to wall with students drinking pints of Green Label, which up until recently was less than £2 a go, and looking as stylish and modern as any group of people you’ll ever see, The Brudenell Social Club is, as anyone who’s spent anytime in the city will tell you, the greatest place on earth. The surrounding area, known locally as Hyde Park, perhaps just to make Londoners feel at home, though on second thoughts that doesn’t sound likely, has long been the epicentre of the local music scene. There are many reasons for this, for starters houses there tend to come with large, spacious basements, often unconverted and the perfect place to stick eggs boxes to the wall and call your own, personal rehearsal room. Then there’s the huge student population which seems to split along a beautifully unwritten fault line. If you’re in the city predominantly for sport, getting drunk and getting a bit more drunk, then you probably live in Headingley, if you like complicated books, French new-wave cinema, and maths rock bands you’ll probably find a lot of like minded individuals in Hyde Park. This has created a stunning hub of like minded individuals and one of the nations most intriguing, different and largest music scenes. Sure they can be elitist, pretentious and intolerant of what anyone else thinks about music, but gosh the bands are great! You want something to listen to and Leeds has got you covered. You want a widescreen post-rock sound, there’s I Like Trains and Vessels, you want swoonsome, Indie-Pop, Just Handshakes and The Wedding Present will see you through, not loud enough for you why not check out Broken Arm or Eagulls too loud how about the folk of Sam Airey or Ellen & The Escapades. It’s the music scene that keeps on giving, and we honestly can’t recommend it enough. That Hookworms second album, The Hum, starts with 10 seconds of barely audible electronic pips is surely just to make sure you’ve got it turned up loud enough, which in the bands eyes is probably as loud as your headphones allow. They’re soon joined by a rapid, but still fairly distant drum beat, but it’s only when the years most joyously aggressive wail of keyboard kicks in that The Impasse comes alive. MJ’s shrieked voice, all anger and passion and barely intelligible lyrics. It lasts barely two and a half minutes, but it’s the most thrilling, goose bump inducing opening to an album you’ll ever hear, and it’s not in anyway psychedelic! Here in lies our complaint about most of the media coverage regarding Hookworms, yes there’s some proggish-psych moments, but to our ears they’re all just a gorgeous coating to the beating heart of a punk-rock band. To go back to The Impasse, it’s not a song that gently washes over you, it’s a brutal slap round the face, it’s the sort of song that drags you kicking and screaming from your bed, sprays you down with a hose and screams “just who are you dying for?” repeatedly in your face. It’s as good as that sounds! To recap, the Leeds based noise-makers released debut album Pearl Mystic last year. That album took them to massed critical acclaim, widespread adoration and a record deal with Domino imprint, Weird World Records. Not bad for a project that apparently still remains a distraction from real life, whatever that might be. All of which us brings them around to a rather daunting prospect, a second album, an album that comes with,dare we say it, expectations? If that prospect sounds nerve-wracking, in reality they make it sound very easy indeed, the way to follow up a successful, low-budget, break-out debut album? To do it just the same as you did before; it’s not that there’s no progress, there’s tonnes, it’s just that they still sound like they’re just doing this for fun, they seem to possess in them not a single careerist intention and through that they might just get a thrilling, long-lasting career, exactly on their own terms, we could all learn a thing or two from these lot! The song gently fades out not into obscurity but one of the many linking tracks, that hold the album together. Whilst their first album equivalents i, ii and iii seemed to act as pauses for breath, quick rest periods between the brutal aural assault elsewhere, here they act almost as the opposite, tying one track into another without giving the listener a moments respite. It creates an almost claustrophobic feel, the album becomes one all encompassing blur of sound, less a collection of songs as a musical movement where songs pop out from behind corners, hit you with a melody and then step back into the heavy droning void. The one exception to the rule is closing track, Retreat, which seems to sit alone, proudly at the end, the poppiest thing on the record. The guitar line has got hints of T-Rex, there’s something resembling a chorus, and it all sounds quite chirpy, like sunlight breaking through the clouds as the old cliché goes. It’s got the easy groove of The Secret Machines or The Beta Band and lyrics like “I’ve got a feeling for love” and possibly “I want to make you feel that death is not practical” it’s as chirpy as they get in Yorkshire! It sounds almost like they stuck a pop song on the end just to show they could do that if they wanted to, the clever, talented bastards! Elsewhere there’s stunning moments throughout, the squelching, feedback coated guitar solo that takes the listener to the breakdown in Radio Tokyo, the lyric in Beginners which we’re certain references MJ’s Grandmother even if we can’t make out the end of the line, and the gorgeously scatty electronics that end it. Best of all, is Off Screen, it emerges from the 40 seconds of fuzzy keys that is v, with a synth that sounds like a plane taking off and a gentle beater rattling on a snare, a drum sound so laid back it’s entirely at odds with the rest of the album, as is the gently melodic hook of the guitar. It’s the middle ground of Joy Division‘s Atmosphere and The Liars superb single The Other Side Of Mt.Heart Attack. It’s a woozy, gorgeous, minimalist sway of a song. MJ sings of “absent desires” and towards the end stretches his vocal to the upper echelons of his range in a screeched emotive coo, the whole things just terribly sad, in the most beautiful way imaginable. It meanders along like this for three minutes, then explodes into walls and walls of noise, it’s a strange concept but this noise is slow noise, where elsewhere it comes crashing out at break neck speed here’s it a slow building crescendo of sound, rippling with unreleased tension, it collapses in on itself just as slowly as it built, and we break down to static and that always present drum beat. It’s over seven minutes but you never want it to end, not just one of the best tracks we’ve heard all year but undeniably the best one the band have ever recorded. What Hookworms have created is an exceptional album, it’s beautifully crafted, and feels like it was created with both a sense of the tracks as part of a greater whole, and also a massive grin on their faces. It’s a complete blast! A joyous progression from their debut to a new exciting musical plateau. They remain a joyous contradiction, the juxtaposition of the brutality of punk and the hazy, melodic strains of prog, and most remarkable of all they make it sound like a match made in heaven. It’s just simply brilliant! The Hum is out now on Weird World Records. 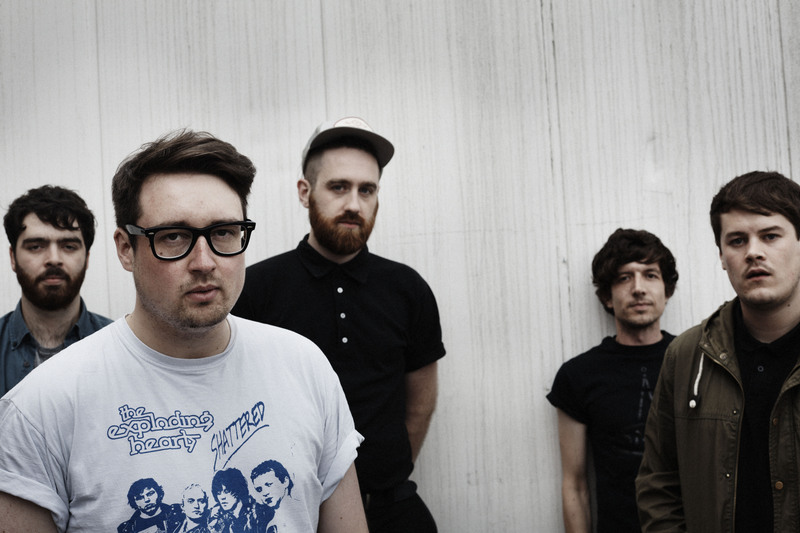 Hookworms play Brudenell Social Club tomorrow (Wednesday 19th of November) before supporting Slow Dive at The Forum in London on 20th December.